The city of Detroit is a fiscal disaster. Its bond rating was downgraded to an even lower junk status last month, it's looking at the prospect of having its finances taken over by the state next year, and layoffs of city workers seem unavoidable. Mayor Dave Bing—yes, that Dave Bing—has promised to chase after the city's debtors, but the Detroit News has discovered that one of those tax deadbeats is the Red Wings. It seems the ownership of Hockeytown's hockey team has had a lease agreement in place since 1980 that calls for the city to collect 25 percent of all cable television revenues for live events at Joe Louis Arena and the Cobo Center, the city's convention hall. The language of that lease of course dates to a time when cable television was in its infancy, but it appears that that part of it has never been honored. The future of sports is cable-television-revenue-based, not attendance-based, yet we'll never see an agreement like this between a professional sports team and its city again—just another indication of how much those teams and their wealthy owners have their cities by the balls. The economic benefits of publicly financed sports stadiums and arenas were always phony, but they appear to be getting phonier as priorities shift. The Red Wings' lease expired in 2010, but while its terms remain binding, the team has since also stiffed the city on stuff like rent, concessions, and property taxes. One city document estimated the Red Wings' total 2011 debt to be $6 million. Another internal document estimated the total cost of the debt to be $71 million, though economist Andrew Zimbalist told the Detroit News the total debt was likely closer to "north of $10 million," since the Red Wings were only on the hook to share the cable TV revenue for home games. There's big money for broadcasting games. Fox Sports Detroit signed a $1 billion deal in 2008 to broadcast the Tigers, Pistons and Red Wings games, according to Forbes. It's not clear how much of that went to the Red Wings. Greg Hammaren, the network's senior vice president, declined comment. It's unclear why the city failed to get the money, but political consultant Eric Foster blamed incompetence. By the time the cable industry exploded in the late 1980s, the provision may have been overlooked because of turnover at City Hall, he said. "It gets into a black hole never to be heard from again," Foster said. "If the city doesn't send you a bill, why are you going to pay it?" A City Council staffer identified the cable clause in a 2007 report, but there was little public discussion about the money. "I think it's just an oversight," said Irvin Corley Jr., director of the City Council's Fiscal Analysis Division, who wrote the report. "But I really don't have an idea (why it wasn't collected)." Olympia Entertainment, the ownership group led by Mike Illitch, who also owns the Tigers, issued the newspaper a mealy mouthed statement saying it would not "discuss or respond to speculation on these very complex topics." 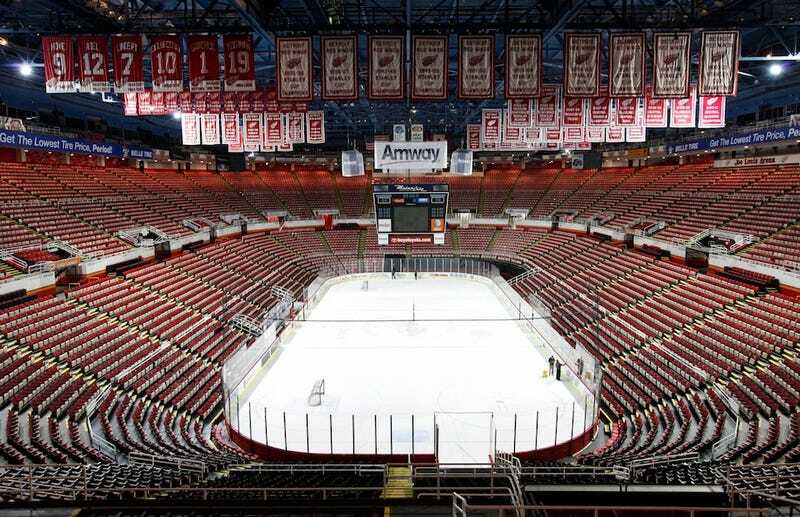 The Red Wings' outstanding debt is said to be part of negotiations for a new lease agreement. What with the ongoing lockout and all, the team right now has little to no money coming in. But another Illitch company, Olympia Development, is simultaneously pursuing a new arena project downtown—and it wants $12.8 million a year from taxpayers to help pay for it.